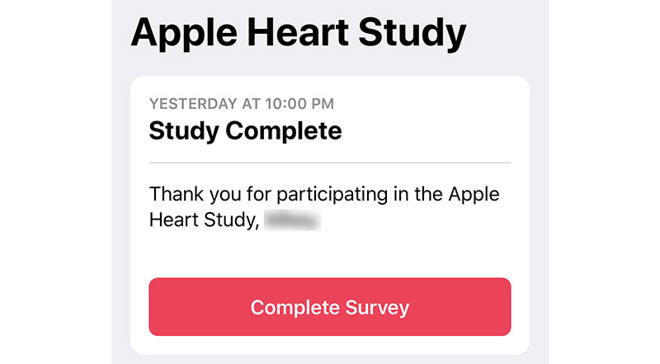 A number of early participants in the Apple Heart Study received messages this weekend saying that their contributions to the program are complete. In November of 2017, during the Apple Watch Series 3 release event, Apple announced the Apple Heart Study. The groundbreaking study, conducted in conjunction with Stanford Health, was designed to determine whether heart rate data collected from Apple Watch can be used to identify irregular heart rhythms and conditions like atrial fibrillation. Earlier this month, Apple announced that it was closing enrollment for the study, and on Sept. 1, many participants received in-app notifications that the program was complete. "Thank you for participating in the Apple Heart Study," read the notification received by one AppleInsider staffer. It went on to list his number of heart data rhythm contributions, as well as number of days in the study. Numerous Twitter users posted screenshots of similar messages on Saturday. Along with the notification, participants were asked to take part in a survey from Stanford Health, with questions ranging from general health queries to whether users would be interested in "continuing to use the Apple Heart Study App to monitor your pulse for irregularities." The latter suggests Apple is considering keeping the app, which includes a mechanism to notify owners of detected irregularities, live following the study's conclusion as a value-added Apple Watch feature. Apple had earlier announced the end date for the study as Jan. 31, 2019. It is unclear if the September announcement marks a study-wide change, though Apple and Stanford Health are likely closing the window for data contributions in stages, as the notifications appear to be going out to those participants who were among the first to sign up. While not confirmed, the Apple Heart Study might continue to collect data from Apple Watch owners whose data warrants further study. Since its inception, the study has coincided with several news stories in which the Apple Watch has saved the lives of users by informing them in time of potential heart conditions and other maladies.